On January 31, Cornwallis began to move his army despite the heavy rain fearing any further delay would cause him to lose his chance of destroying Greene's army. Some six weeks after the engagement, Cornwallis wrote that he had ordered a detachment under Lieutenant Colonel Webster to "make every possible demonstration by cannonading and otherwise, of an intention to force a passage" at Beatties Ford while he would march down the river to Cowan's Ford. General Greene arrived and ordered General Davidson,who had placed his men at the various fords along the eastern bank, to slow the British Army's crossing of the Catawba River. Greene and Morgan then left to accompany the bulk of their forces towards Salisbury, North Carolina. Davidson dispatched a company of cavalry and infantry southward four miles to Cowan's Ford. The cavalry was to see that the British did not make a surprise crossing under cover of darkness. Toward nightfall Davidson joined the detachment at Cowan's Ford. Davidson evidently feared that Tarleton's troops might slip across the river in the darkness and get behind him, from which position they could attack him as the British infantry began its crossing and therefore set up camp a half mile from the river, with pickets watching from the water's edge the Cowan's Ford. Near daybreak, after a difficult march in which the British lost some of their cannon, Cornwallis's army reached Cowan's Ford. Cowan's Ford was actually two fords; one, the horse ford, though shallower than the other, was longer, because it crossed the stream to an angle; the other, called the wagon ford, went straight across the river but was much deeper. Without hardly hesitating, the British began crossing the swollen stream straight across along the wagon ford and soon the horses were over their heads in the raging torrent. Davidson's forces immediately began to confront the Redcoats. The militiamen were picking off many British soldiers as they struggled in the water. The Redcoat's return fire was heavy. Shortly after arriving on the scene, Davidson was struck from his horse by a rifle ball through the heart. Late that evening Davidson's naked body was found. His corpse was evidently robbed by British soldiers, a fact established on July 3, 2001 when Davidson's wallet was brought back from England where it had been held in the Public Records Office in London since the Revolution. 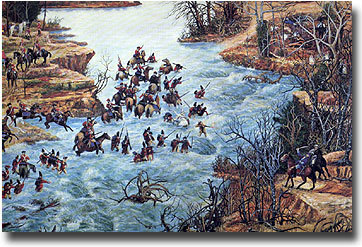 On February 1, at 1:00 A.M., he would march down the river to Cowan's Ford, where he planned his major drive to cross the stream. Meanwhile, Greene had arrived at the Catawba and with Washington had visited Morgan and Davidson at Beatties Ford and planned his strategy. Though no records of this meeting reveal what was said, it is evident by what immediately followed that Greene directed Davidson, who had placed his men at the various fords along the eastern bank, to do what he could to slow Cornwallis' crossing. And then he and Morgan set out towards Salisbury. Soon after they left him, Davidson dispatched a company of cavalry under Col. Joe Graham, who had by now recovered from his wounds at Sugaw Creek in late September, and infantry led by Col. William Polk, southward 4 miles to Cowan's Ford. Graham was to keep a patrol on the move to see that the British did not make a surprise crossing under cover of darkness. Toward nightfall, Davidson himself led a detachment to Cowan's Ford and set up camp a half mile or so back from the river, but he assigned a picker to watch from the water's edge the Cowan's crossing point. At 1:00 A.M., Cornwallis reveals in his own account of the skirmish at "McCowan's ford," he began his march to the river, which was reached after much difficulty and the loss of some of their cannon, "the morning being very dark and rainy & part of our way through a wood where there was no road." But instead of going to Beatties Ford, which his actions there during the day had indicated he would try to force, he moved down the river to Cowan's. This was actually 2 fords; one, the horse ford, though shallower than the other, was longer, because it crossed the stream obliquely; the other, called the wagon ford, went straight across the river. For a few minutes, the action was lively. The militiamen were picking off many British struggling in the water. The return fire was heavy, and hardly had Davidson arrived when he was struck from his horse. In a few minutes, several other Americans were killed. The British loss was greater, but the skirmish proved a defeat for the Americans. Their resistance hardly slowed Cornwallis' advance. It would be recorded, however, as the last battle with an invader on Mecklenburg soil. In the Fall, on October 19, Cornwallis would surrender to Gen. George Washington’s Army at Yorktown, Virginia. Late that evening, Davidson's body, stripped and rain drenched, was found by David Wilson, brother-in-law of his kinsman, Maj. John Davidson, Pastor Thomas McCaule of Centre Church, and Richard Barry. They took the body to the home of David's widowed stepmother, Mrs. Samuel Wilson. Fortunately, they were able to dress the body in a suit left there by Capt. James Jack, Mrs. Wilson's brother. That night by torchlight, with Pastor McCaule conducting the brief service and with Mary Brevard Davidson standing stalwart beside the red clay grave, Davidson was buried in Hopewell Presbyterian churchyard, which was located on Beattie’s Ford Road, approximately 5 miles south of the battlefield. “The morning was cloudy, and a fog hung over the water, so that Lieutenant Thomas Davidson’s sentinel could not see them until they were one hundred yards in the river. He instantly fired on them, which roused the guard, who kept up the fire, but the enemy continued to advance. At the first alarm, those under General Davidson paraded at the horse ford, and (Captain Joseph) Graham’s cavalry was ordered to move up briskly, to assist the picket, but by the time they got there, and tied their horses and came up in line to the high bank above the ford, in front of the column, it was within fifty yards of the eastern shore”. The dismounted American cavalry troops “took steady and deliberate aim and fired. The effect was visible. The first three ranks looked thinned, and they halted. Colonel Hall was the first man who appeared on horseback, behind (the advanced guard of soldiers) about one hundred yards. Colonel Hall “came pressing up their right flank on the lower side, and was distinctly heard giving orders, but we could not hear what they were. As each group of four British soldiers “reached the shore, they dropped their poles and brought their muskets and cartridge boxes to their proper places, faced to the left, and moved up the narrow strip of ground to make room for the succeeding section, which moved on in the same manner. By the time the front rank got twenty or thirty steps up the river, they had loaded their pieces and began to fire up the bank. The Americans fell a few steps back, and when ready to fire would advance to the summit of the hill, twenty-five or thirty steps from the enemy, and they devolved up the river bank. The British “moved steadily forward, their fire increasing, until their left reached the mouth of the branch, upwards of 30 poles (approximately 500 feet) from the ford. The ravine was too steep to pass. The rear of their infantry and front of their cavalry was about the middle of the river when the bugle sounded on their left, on which their fire slackened and nearly ceased” while they were loading their pieces. “In about a minute it sounded again, when their whole line from the ford branch advanced up the bank, with their arms at a trail. The hill was in many places so steep that they had to pull up by the bushes. General Davidson, finding them advancing with loaded arms, ordered a fighting retreat for one hundred yards. His infantry retreated in disorder from the contest. They dispersed in small squads, and took through the thickets in order to evade the enemy’s cavalry. Captain Joseph Graham’s cavalry, which was formed about one hundred yards in the rear of where Davidson fell, moved off in order. Major David Wilson and two others found the General’s body in the evening, carried him off in the night, and buried him at Hopewell Church.